Okay so, I know I started this whole Someday Art Club thing, got everyone all excited and then DISAPPEARED from the face of the earth. The Wedding Season rush of August and September pretty much consumed my life - but now that it’s almost October and I have some pumpkin-spice flavoured caffeine coursing through my veins, it’s time to get back on track! 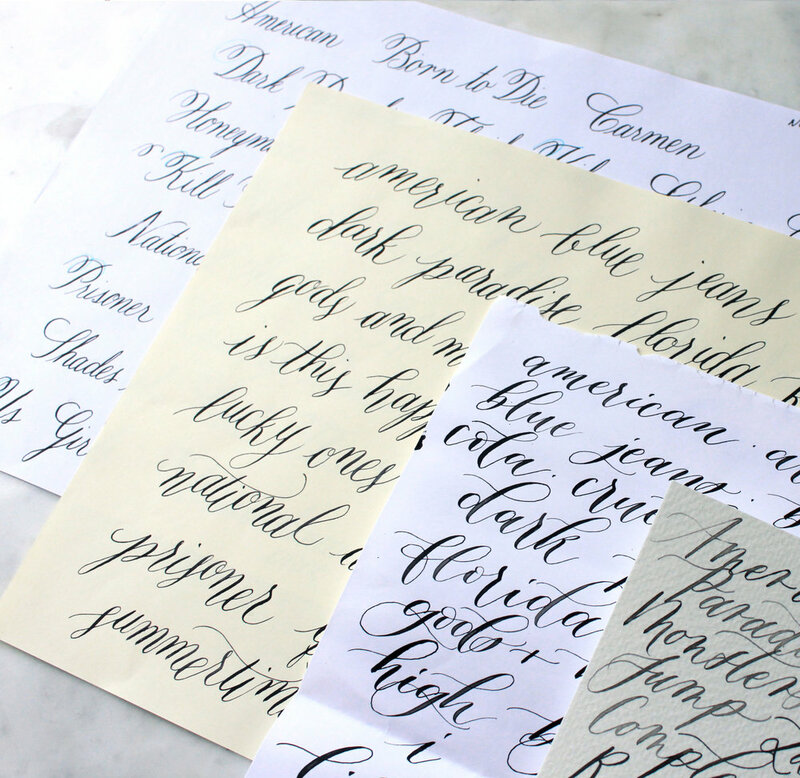 So, in order to do that, I am sharing my all time favourite Calligraphy Practice Exercise with you guys. The Someday ABC’s ! I’M EXCITED. I hope you are too. 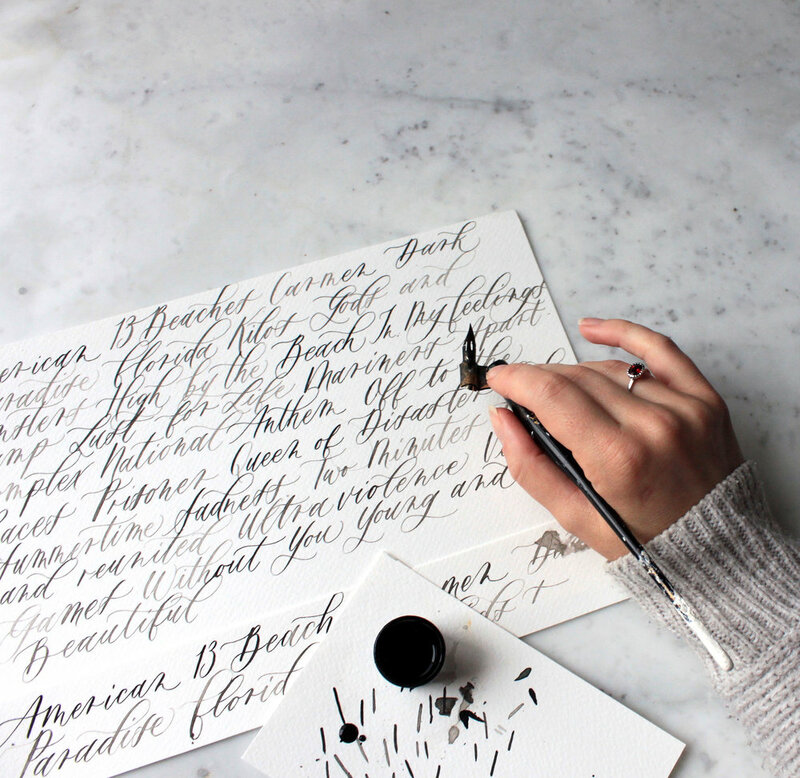 A little back-story for you: When I first learned calligraphy, my teacher (the wonderful and amazing Joy Deneen) would have us do this great exercise to practice words. You pick a Category (So for example - Cities) and you fill an entire page with an alphabetical list of cities, with one for every letter of the alphabet (So like - Athens, Barcelona, Chicago, and so on). Despite my earlier mention of pumpkin spice, I’m not exactly the most basic person, so I would get REALLY specific when doing my Alphabets…. As you can see by the alphabetical list of Lana Del Rey song titles (at one point I even did Quentin Tarantino movie characters). As much as practicing things like days of the week, colours, and individual letters, is fun and very useful - there’s something about getting weirdly specific about things you’re SUPER into that makes practice just that much more enjoyable (which means you’re that much more likely to actually do it!). Not only is practicing words that make you happy a fabulous self-care exercise, it allows you to truly enjoy taking the time to practice your craft & develop your own unique style. Since I’ve been so crazy busy working on seating charts & other wedding signage since May, there are two things I’ve been MAJORLY missing in my life - actually practicing calligraphy, and doing calligraphy for FUN. Doing this lettering exercise forces me (and hopefully you) to do BOTH. You can use any medium and tool you want! Nib and Ink, Brush Pen, Paintbrush, Pen, iPad/Apple Pencil - whatever you’re most comfortable with! It would make my so heart happy to see you using this practice method! Use the hashtag #SomedayABC and TAG me in it so I can see your work! (I always try to repost them in my Stories!) This is a great way to hold yourself accountable for your practice AND see who else is into the same oddly specific things that you’re into! Enjoy the process, see your work improve and help encourage others along the way by engaging with their work! Also, hang on to the Alphabet practice pages that you do during these 4 weeks, and try doing them again a few months from now to see how your skills improve and how your style evolves! My teacher encouraged us to keep all of our practice sheets, and I’m so glad that I did since it allows me to look back at how far I’ve come and feel good about the difference that practice and experience has made.